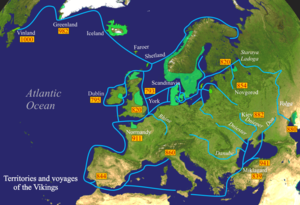 ^ Viking (people), Encyclopedia Brittanica. ^ Peter Sawyer, The Viking Expansion, The Cambridge History of Scandinavia, Issue 1 (Knut Helle, ed., 2003), p.105. ^ Graham­-Campbell, James: The Viking World, Frances Lincoln Ltd, London (2013). Maps of trade routes. ^ Kahn, Charles. World History: Societies of the Past. Portage & Main Press. 2005: 9 [March 18, 2011]. ISBN 978-1-55379-045-7. ^ Frank, F. The Invention of the Viking Horned Helmet. International Scandinavian and Medieval Studies in Memory of Gerd Wolfgang Weber. 2000. （原始内容存档于2014-04-13）. ^ Did Vikings wear horned helmets?. The Economist. www.economist.com. [10 April 2014]. ^ The Gjermundbu Find - The Chieftain Warrior. [10 April 2014]. Brink, Stefan. 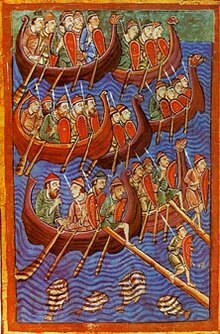 Who were the Vikings?. (编) Brink, Stefan; Price, Neil. The Viking World. Routledge. 2008: 4–10. ISBN 9780415692625. Roesdahl, Else. The Vikings. Penguin Books. 1998. ISBN 9780140252828.